Foolish undead. You think you can stand up to Dragonborn? It is here: The Elder Scrolls V: Skyrim, 5 years after the previous entry in the series, Oblivion. Much like in Oblivion, you start in police custody, only you are on your way to your own execution. You create your character from scratch as your name gets called. You get to choose from a handful of races, though ultimately this proves to be cosmetic for most as the racial perks don’t really affect gameplay very much. Fortunately for you, a dragon comes in out of nowhere, causing shear chaos allowing you to escape. 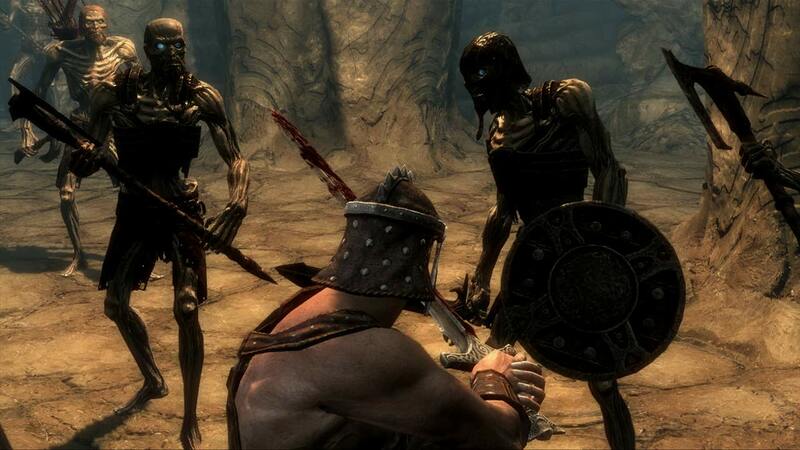 After you complete this first quest, you are free to explore Skyrim and follow the story (or not). The first word that comes to mind when describing the province of Skyrim is big. Skyrim is one huge, beautiful world to explore, and explore you will. While towns are marked on your map, you aren’t allowed to fast travel to them until you have walked by them at least once. Along the way, you will also discover other things like dungeons to explore or bandit camps to raid. One of the most thankful improvements in Skyrim is the level-up system. In Oblivion, you are expected to either select or create a class. Your class determined your major skills. The trouble was that as Oblivion was my first time playing an Elder Scrolls game, I did not know what skills would be more useful than others, so I had some rather useless ones in my major skill set as well as more useful ones winding up in my minor skills. In Skyrim, however, there is no such distinction between major and minor skills. Much like in Oblivion, your skill levels go up the more you use them. For instance, your two-handed weapon skill goes up every time you land a successful hit on an enemy with a two-handed weapon. Likewise, your speech ability goes up when you managed to verbally convince someone to see things your way. When you have had enough skill increases, you are rewarded a level-up with the ability to select perks for use in your skill trees, here in the form of constellations. Of course, the most perk unlocks require your skill to be at a certain level and that you unlocked the prerequisites. Nonetheless, character building feels a lot more natural than it does in most other RPGs, like Demon’s Souls, because your skill increases depend purely on your own style of gameplay. The most impressive aspect of Skyrim is the shear amount of stuff to do. In addition to the main story, there are 5 additional questlines you can complete. More than that, you will run into random NPCs that give you tasks for you to do (or not). Really, how you play Skyrim is entirely up to you. For the most part, combat feels a lot like it did in Oblivion. The difference is blocking is not exclusively mapped to your left hand. In Skyrim, you can dual-wield one-handed weapons, or have a weapon in one hand and a spell in the other. Of course this is in addition to the standard two-handed weapon and weapon-and-shield combinations. Since spells no longer occupy their own weapon slot like they did in Oblivion, combat using spells can take some getting used to, but it does wind up making for more intense fights. The graphics are fantastic. Once again, in a huge game like this, details get sacrificed for the sake of keeping the game running smoothly. Upon closer inspection, you can see that textures of things like rocks don’t look particularly good. Nonetheless, you will often walk around Skyrim and see things like a waterfall and think, “I’ll bet this is exactly the thing Bethesda wanted to take a screenshot of.” Unfortunately, at least for the PlayStation 3 version, framerates are not always stable, especially in fights were a lot of NPCs are involved. The sound is pretty good too. The overall musical score of Skyrim, at least I think, is a definite improvement over Oblivion’s. Skyrim’s music sounds very beautiful, yet somehow gives the game a slightly bleak feel, which is pretty much Skyrim’s tone as a whole while Oblivion, both in the environment and score, was big and friendly. I’m just not too keen on the voice-acting, namely how many NPCs share dialogue bites. It’s not as bad as it was in Oblivion, but still rather annoying. In an interesting twist, NPCs, depending on race, are given ethnic accents. The only thing is many Nords wind up sounding like Arnold Schwarzenegger. My biggest issue with Skyrim is that it is a bit glitchy. A minor instance is when I was fighting a dragon near the College of Winterhold. As I fought, mages just walked by as if nothing was happening. Normally, NPCs would come and assist in fighting dragons, but the mages just ignored it as a result of an apparent bug in their AI. Finally, I ran into what I wish I wouldn’t: a bug that rendered a quest impossible to complete. I had to kill a vampire, then report to a Companion that I had done the deed. The problem was that my reporting this vampire fatality was not showing up in my dialogue options with this guy, so I couldn’t turn the quest in. Fortunately, it was a side quest that was not part of any questline, so it didn’t hold anything like that up. Nonetheless, I think Bethesda should have bug-tested their quests more adequately, especially since this was really problematic in Fallout 3. Nonetheless, Skyrim is one of the deepest games to have come out in a while. Much like with Red Dead Redemption, I think I should recommend it for a 2011 “Anti-Call of Duty” award. Bethesda clearly saw this one project as what they hoped to be a killer app instead of merely launching a new game every year. RPG fans owe it to themselves to pick up Skyrim. While Skyrim has its share of problems, it is definitely a game that’s more than a sum of its parts, and is probably the ultimate single-player experience. EDIT: I found a way to work around the quest I thought was impossible to complete. The quest was called “Trouble in Skyrim”, one of the “extra work” type quests you can get from the Companions. It turns out that I had other active Companion quests at the time, which was causing the dialogue to get confused. When I turned those other quests in, I was able to talk to Farkas about killing the vampire, and thus the quest was complete. Nonetheless, I still feel this is something that probably could have been averted with more adequate bug-testing.